Hampton Creek is located just below the North/South borderline on the East side of town. 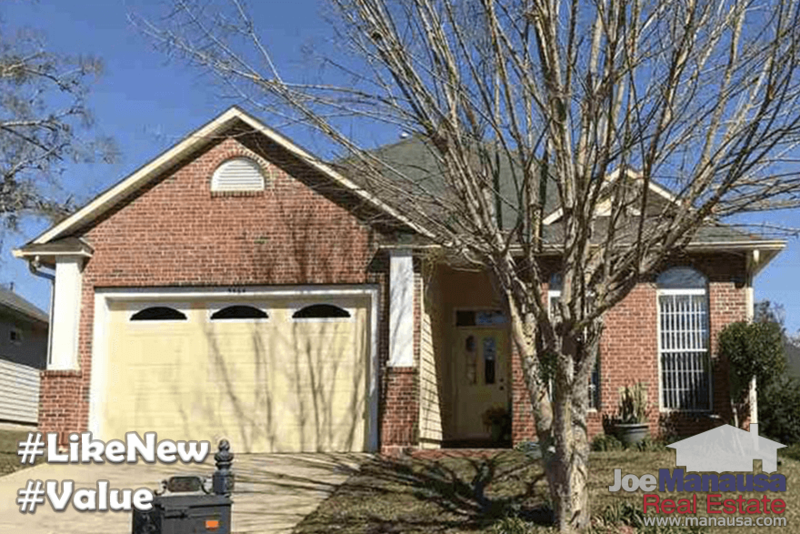 This popular neighborhood features nearly 200 newer homes and can be found out Apalachee Parkway just before you reach Apalachee Regional Park. With newer homes all the rage with buyers, the single family detached homes and townhouses in Hampton Creek are a VERY option when you cannot find something brand new that fits your budget. 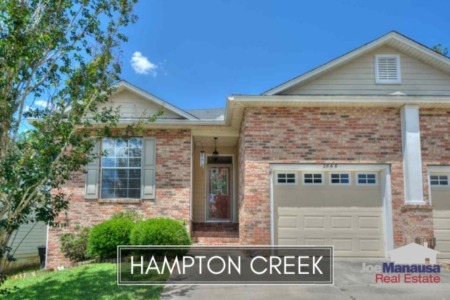 You can still find homes for sale in Hampton Creek priced in the $150s, and I promise you that will not be the case much longer. Homes like these cannot be reproduced today for less than $250K, and the cost of land and construction is moving higher. These homes are a very safe purchase for long-term appreciation. It is important to note that the narrative contained below is for sales through December for all previous years, but through 26 days of March in 2017. The graphs and the closed sales table will be continuously updated into the future (meaning bookmark this page if you always want to know the current status of homes in the Hampton Creek). Average home prices fluctuate quite often in Hampton Creek due to the fact that we see both single family detached homes (more expensive) and town homes (less expensive) showing up in the same report. When more of the former are sold, we see higher average prices, while the opposite is true when more of the latter sell. Over time, the average price graph is good to see what buyers are paying to get into the neighborhood, but we have to look at at values in the next graph to get a feel of how properties have been appreciating. The current $151,800 average home sales price is slightly lower than last year's average. Home sales activity in Hampton Creek was busier last year than any we've recorded since 2007. 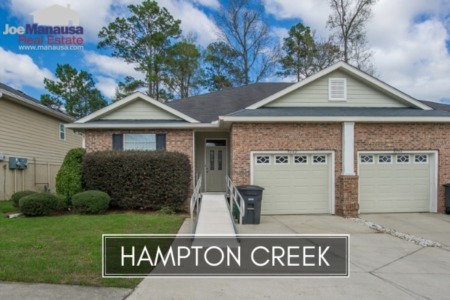 Currently, there are 5 homes for sale in Hampton Creek and 1 is already under contract, which is a lower ratio than what we are seeing around Tallahassee. This typically indicates that sellers might be reaching higher than the market is currently ready to absorb. Average home values in Hampton Creek were up almost 7% last year, and thus far in 2017 have shot up another 7% to $122 per square foot. Values are returning in Hampton Creek and homeowners should be gaining significant equity this year. Many homeowners continue to owe more money on their mortgages than their homes are worth, but every time we see values rise it means that fewer homeowners are trapped and might feel free to go ahead and move. The average home size sold in Hampton Creek typically falls in a range of 1,200 to 1,500 square feet, and this year has started off with the smaller townhouse sales. The 3 sales thus far in 2017 have averaged 1,246 square feet. I hope you enjoyed our March 2017 update on home sales in Hampton Creek, please feel free to drop me a note if you have questions not covered in this report.